Following up their successful 2016 release “The Nashville Session”, British funk and soul jazz veterans The New Mastersounds returned to the same analog studio to record another set of tunes in front of an invited local audience. The live set was recorded and mixed directly onto 1/4″ stereo tape reels on a hot June evening: no edits, no overdubs. This time, instead of playing the organ, keyboardist Joe Tatton plays various pianos and a vintage analog synthesizer, while of course Eddie Roberts is on guitar, Simon Allen is on drums and Pete Shand is on bass. Eight of the tunes performed were selected to go on the vinyl LP, two more are included in the CD and digital release. 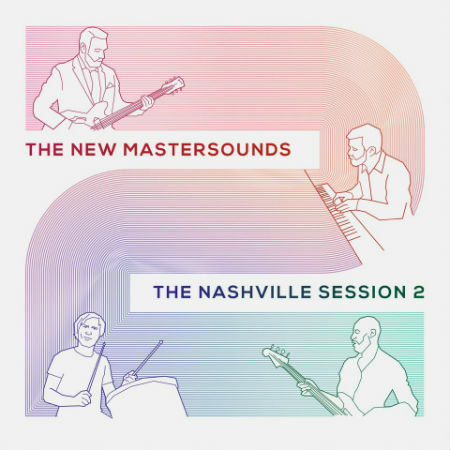 “The Nashville Session 2″, perfectly captures the energy and chemistry between these four musicians at the top of their game after nearly two decades together. An essential buy for existing NMS devotees, this record will also appeal to fans of Greyboy, Quantic, Smoove & Turrell, Lack of Afro, The Meters, Breakestra etc… The tunes are all NMS originals apart from a cover of the John Cameron / KPM cult classic “Afro Metropolis”. In the course of a career spanning 20 years, 16 albums, and countless tours and live performances around the globe, The New Mastersounds have carved out a unique space for themselves as world-class purveyors of contemporary jazz-funk. They have collaborated or jammed with an impressive array of musicians, DJs and producers, including: Lou Donaldson (Blue Note), Corinne Bailey Rae (EMI), Quantic (Tru Thoughts), Carleen Anderson (Young Disciples / Brand New Heavies), Keb Darge & Kenny Dope (Kay Dee Records), John Arnold (Ubiquity), Mr Scruff (Ninja Tune), Snowboy (Ubiquity), Fred Everything (2020Vision), Andy Smith (Portishead), James Taylor (JTQ), LSK (Faithless), Page McConnel (Phish), Karl Denson (Lenny Kravitz / Greyboy Allstars), Melvin Sparks (Blue Note Records), George Porter Jr (The Meters), Fred Wesley, Maceo Parker (JB’s), Ernest Ranglin and Art Neville (Neville Brothers, The Meters), and many, many more.